ON SALE - LIMITED QUANTITY !! The new Model 81041 is a portable, self-contained RF Wattmeter that features a studio-quality analog meter and USB interface. Numeric, analog meter, and bar graph data are simultaneously displayed on a PC's monitor. The functions indicated are Forward and Reflected Power, both in Watts and dBm, plus an automatic calculation of SWR and Return Loss. The internal dual socket line section and forward/reflected switch gives the user the ability to display either forward or reflected on the analog meter, while both are displayed simultaneously on the PC. Our use of a rugged shock mounted meter with a mirror-backed scale along with superior taut band technology, provides reliable and accurate readings of either forward or reflected power on the meter. The Model 81041 uses standard elements to detect average RF power from 100 mW to 10 kW over a Frequency Range of 2 MHz to 2.3 GHz. Software and a detachable six foot USB cable are included for a simple installation on any PC using Windows Vista, 2000, XP or NT. No additional cables, AC or DC power adapters, batteries or custom remote sensors are required. Type N female connectors are standard with over 20 interchangeable QM connectors available such as 7/16, SMA, UHF, BNC and TNC types in male and female genders. Your confidence in the quality and dependability of the Model 81041 Wattmeter is assured with the Coaxial Dynamics Two Year Limited Warranty. Measure RF Power in 50-Ohm coaxial cable and transmission lines, and accept plug-in elements in the range of 100 mW to 10 kW full scale, and from 0.45 to 2300 MHz. Elements are sold separately. Easy to use. Simply connect the Wattmeter between the transmitter and antenna or dummy load, plug in the appropriate measuring element and select forward or reflected direction. The RF power is directly displayed on the 4-1/2 inch triple scale meter. Versatile and strong, the Model 81000-A can be used with accessory cables up to 200 feet from the meter and is protected by a rugged, virtually indestructible shock-proof housing. For added convenience, two sockets for storage of additional elements are located on the back of the unit. Your confidence in the quality and dependability of the Model 81000-A Wattmeter is assured with the Coaxial Dynamics Two Year Limited Warranty. 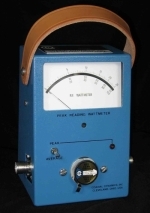 When you need Peak power measuring capability in the 2 to 2300 MHz frequency range and from 100 mW to 10 kW, then you need to get your hands on our Model 83021 RF Peak Reading Dual Socket Wattmeter -- only from Coaxial Dynamics. Elements are sold separately. Similar in appearance and operation to our standard Model 81021 Wattmeter, the Model 83021 converts from Average Reading to Peak Reading, with the flip of a switch, by inserting a peak reading amplifier between the element and the meter. The Model 83021 is designed to measure RF power in amplitude modulated systems such as television, telemetry, radar and peak envelope power (PEP) such as SSB and AM signals. The plug-in elements available for the 83021 are inter-changeable with those for our Model 81021. Furthermore, peak only (high power) elements are also available. To compliment each application and specific requirement, elements are selected separately. 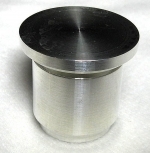 Special elements for high power or extended frequency ranges are made custom by request. Self-contained and requiring no line power in either Peak or Average mode, the Model 83021 is the right choice for portability and functionality. With peak reading circuitry that operates on one 9 volt replaceable alkaline transistor battery (supplied), normal, portable usage is possible for at least 90 days or the life of the battery. An optional, rechargeable battery is also available. Your confidence in the quality and dependability of the Model 83021 Wattmeter is assured with the Coaxial Dynamics Two Year Limited Warranty. Dielectric 8952-A in-line wattmeter with a remote sensor. Uses Bird 43 elements to cover any frequency or power range. Large reflective meter scale for easy reading and high accuracy. Cable is approximately 25 feet long. Elements sold separately, use Bird or Coaxial Dynamics elements. Used, in excellent condition. BNC Jumper Cable RG8X 24"
With the Model 81050 Directional Wattmeter you can now measure RF power in 50-Ohm coaxial cable and transmission lines without the need for additional plug-in elements. 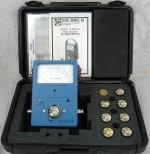 Model 81050 comes complete with the same 4-1/2 inch taut band meter movement, Quick Match RF Connectors, and precision line section that are used in our Model 81000-A and 83000-A Wattmeters. These features plus a special non-removable Broadband Element allow full-scale power measurement on any one of 5 selectable ranges of 5, 15, 50, and 500 Watts across a frequency range of 25 to 1000 MHz. Versatile and reliable, the Model 81050 is also easy to use. 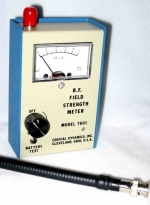 Simply connect the Wattmeter between the transmitter and the antenna or dummy load, select the appropriate power range on the 5 position switch, and read the power directly on the mirrored backed meter when the frequency is between 100 and 1000 MHz. Below 100 MHz, multiply the meter reading by the correction factor found on the chart on the back of the Wattmeter. Your confidence in the quality and dependability of the Model 81050 Wattmeter is assured with the Coaxial Dynamics Two Year Limited Warranty. The Coaxial Dynamics series of Panel Mount Wattmeters are designed to measure RF power in 50-Ohm coaxial cable and transmission lines, and accept plug-in elements in the range of 100 mW to 10 kW full scale, and from 0.45 to 2300 MHz. Several different models are available in either single socket or dual socket line sections. The Panel Wattmeter can be installed up to 200-feet from the Line Section with the permanently attached DC cables (10-foot normally supplied). Your confidence in the quality and dependability of these Panel Meters is assured with the Coaxial Dynamics Two Year Limited Warranty. 19" Panel with single meter, FWD/RFL switch and 7/8" Dual Socket Line Section. 19" Panel with single meter and 7/8" Single Socket Line Section. 19" Panel with dual meters and 7/8" Dual Socket Line Section. See the product flyer for others.